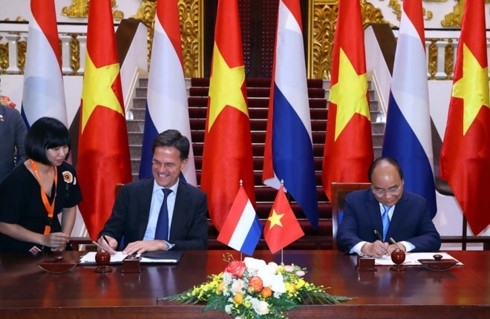 AsemconnectVietnam - Vietnam and the Netherlands have issued a joint statement on the official visit to Vietnam by Dutch Prime Minister Mark Rutte on April 9 at the invitation of Prime Minister Nguyen Xuan Phuc. Both sides expressed their support to efforts to build a strong and prosperous ASEAN Community and further step up the ASEAN-EU cooperation towards a future strategic partnership. Cooperation between the two most successful regional organizations sends a strong signal in favour of effective multilateralism and international rule of law, also when dealing with global issues. Both sides reaffirmed the importance of peace, security, and stability in the South China Sea, and respect for the maritime order based on international law, as reflected in the United Nations Convention on the Law of the Sea (UNCLOS), including freedoms of navigation and overflight. Both sides expressed support for the full and effective implementation of the Declaration on the Conduct of Parties in the South China Sea (DOC) and the ongoing efforts by ASEAN countries and China towards the early conclusion of an effective Code of Conduct for the South China Sea that would be fully consistent with international law in the maritime domain, as reflected in UNCLOS. All sides shall settle disputes by peaceful means, refrain from threat or use of force, and abstain from any actions that may increase tensions or complicate the disputes. The two sides aim to strengthen cooperation in training and education, exchanges of experts and research institutes of the two countries in the fields of international law, especially the Law of the Sea.